A green and beautiful land, sending a parcel across the Irish Sea to the Emerald Isle couldn’t be easier with DPD Local Online. When you book a parcel delivery service with us, you can be confident that you’re booking a parcel service that you can trust. We have an extensive courier delivery network which will help you get your parcel there in the safest and most efficient manner, no matter what you’re posting to Ireland. With our express and economy parcel service options, deciding the best way of posting to Ireland is easy. Our easy-to-use courier delivery is designed to help you find the best value postage to Ireland without losing any quality of service. Thanks to our local knowledge as well as our experience of international parcel post, we’ll ensure that your parcel to Ireland arrives exactly when you want it to; whether your destination is off the beaten track in one of Ireland’s quaint rural towns, on in the bright lights of Dublin or Cork. To get a quote and book your postage to Ireland, just use our simple online form and let DPD Local Online do the rest. Do I need to deal with customs when sending from the UK to Ireland? Luckily, Ireland is a member of the European Union, meaning that there’s no need to worry about customs when posting to Ireland from the UK. How much does it cost to send a parcel from the UK to Ireland? Postage to Ireland costs at as little as £12.50 plus VAT when you book through us, making our prices the best on the market. 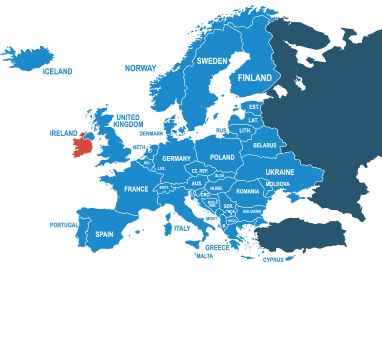 And thanks to our extensive delivery networks through Ireland, express parcel delivery is amazingly inexpensive, too! Cheap parcels, quality service. How should I address my parcel for delivery to Ireland? Ireland uses the same addressing system as we do here in the UK, so labelling is fairly straightforward. You can refer to this addressing guide provided by the Universal Postal Union for an example. As a general rule, you can send anything to Ireland that you could send to the UK, but you should still contact the Irish Tax and Customs office if you’re unsure about anything you’re sending. Plus, you can also check out our prohibited items list for goods that can’t be carried by our couriers.